Denimheads are the new squatters. BPD Expo temporarily took over New York City’s largest vacant retail location on the corner of Fifth Avenue and 50th Street June 22-23 for two days of A/W 2017-18 denim trends, innovation and hands-on activities like denim crochet and shibori lessons. Dubbed the “anti-trade show” by WGSN, hints of the storefront’s past life as a gilded two-story Juicy Couture flagship were evident. However, a blue light chandelier, a double-sided wall of vintage denim (for inspiration and for sale) and an expansive array of indigo art by the likes of Ryan Sullivan of Rigg and others, transformed the building into a renegade denim venue. Passersby, tourists and locals alike, stopped outside the windows to watch BPD Washhouse technicians dry process jeans and embroider custom details onto garments. The public was allowed access to one side of the vintage denim pop-up shop, where they snapped up varsity jackets, sequin-embellished shorts and workwear tops. Grandtex Textile Sales Manager Andrew Budiarto said the location was “awesome” and offered the right environment for the Indonesian mill to meet with customers face-to-face. “It’s important to connect in person. This show has a great atmosphere for meeting designers,” he explained. Curtin said the show welcomed a steady stream of new visitors. “These were solid visitors for our vendors,” he added. New exhibitors included Blue Farm, Santanderina, Soorty and Varcano. The show also hosted a duo of first-time exhibitors from Vietnam, Le & Le Corporation, which showcased its heavy embellishments, and Viet Hong Textile and Dyeing. Stretch remained a large portion of mills’ collections for A/W 17-18. Bi-stretch and 4-way stretch were important stories for Pakistan-based mill Indigo. Rameez Rizvi, Indigo senior marketing manager, said the levels of stretch continue to increase each season. About 90 percent of Grandtex’s men’s and women’s lines was stretch. Kurabo saw an uptick in warp stretch for boyfriend jeans. Corduroy highlighted tri-blends to create a bundle of lightweight super stretch and comfort stretch fabrications with a soft hand feel. Softness was prevalent in Santanderina’s collection, which included coated Tencel, 100 percent Tencel and Tencel and cotton blends. Indigo on indigo stripes and frayed fabric emphasized the fabrications’ fashion potential, meanwhile men’s brands appear to be taking note as well. A representative from Santanderina said more brands are incorporating a soft hand feel and drapey look to their men’s collections. Mills reported that vintage looks are on the up and up. Grandtex tapped into the retro ’70s shade Azure blue, similar to the shade Zara has touted during the Spring ’16 season. Corduroy New York Sales and Marketing Ed Eckstein said the Mexican mill has seen a demand for dirty washes achieved through different color wefts and overdyed indigo for both men and women. A representative from Kurabo said there’s a “rebirth” in untraditional selvedge in fun, custom colors, as well as chip-away color. Meanwhile, Mount Vernon saw interest in denim with less slub for a look that is reminiscent of retro, European Levi’s 501 jeans. “People want the look of the ’80s, with the comfort of now,” said David Mitchell, Mount Vernon director of business development, denim and piece dyed fabrics. Of the 76 products Mount Vernon brought to the show, just four were 100 percent cotton. Mitchell said the mill’s collections have become dense with performance, naming Silvadur and Lycra’s Cordura and Tough Max as key components. In fact, Mitchell reported that performance is the single “true trend” in denim nowadays. “It’s very challenging right now because mills have to be all things to all people,” he explained. While most mills presented expanded collections, less was more for Prime, Global Denim’s new line of premium denim produced out of its brand new state-of-the-art production facility in Mexico. “The focus was on fabric, not crazy washes,” said Michelle Branch, Global Denim creative director. For the debut collection, the mill zeroed in on 10 fabrications—two core stretch, two bi-stretch, two fashion and three rigid, including a light chambray and two super heavy options. The fabrications are offered in just two washes. Branch said the mill saw an early positive reaction to its chambray, black, warp-only stretch for men and 4-way stretch. 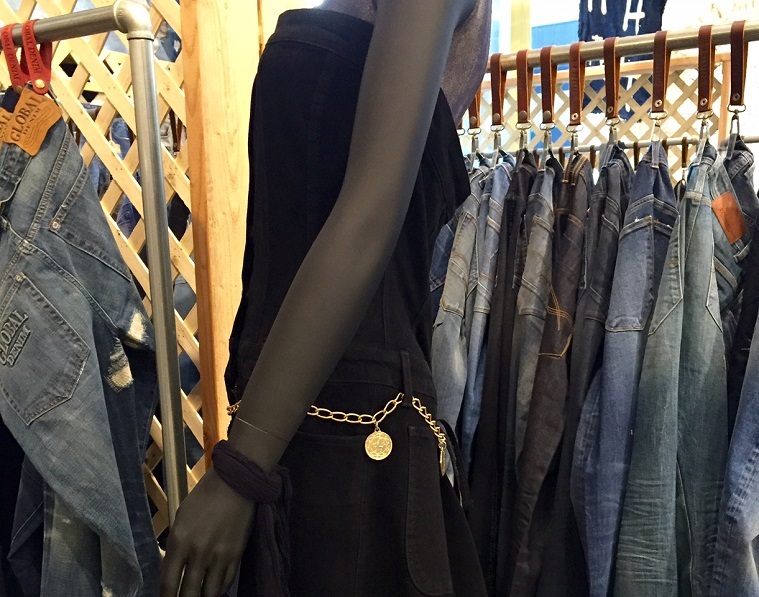 Geared toward a customer a step above Global Denim’s core mid-tier clientele, Prime stood out with a brushed black denim gown with a velvety, moleskin feel—an eclectic statement piece that fit right in with the expo’s creative atmosphere.